We often tend to encounter instances while using formulae performing day to day operations where the formulae results in an error. 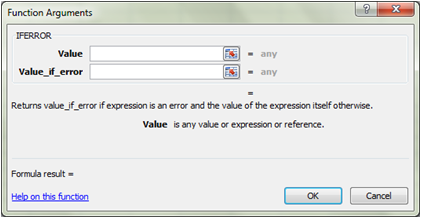 Often, some basic users prefer manually correcting those errors and so advance users go one step ahead using a combination of "IF" & "ISERROR" functions. Even I'm one of those users who prefer using the "IF" & "ISERROR" combination until I came across the "IFERROR" function. 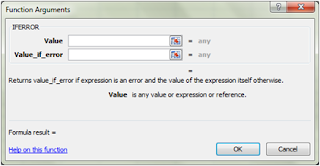 According to Microsoft, "IFERROR" evaluates #N/A, #VALUE!, #REF!, #DIV/0!, #NUM!, #NAME?, or #NULL! type of errors. Say﻿: Cell A1 contains a numeric value and Cell A2 contains 0 as value. You intend to perform a simple operation A1 divided by A2 (=A1/A2). In our example, the result would be #DIV/0!. Now, lets redo this simple division using "IFERROR" function. The formula can be written as "=IFERROR(A1/A2,0)" wherein the formula would asses that if the result of A1/A2 is an error the formula should put in 0 instead of the error. This is indeed very helpful function which can be used with ease to perform various operations in an Excel sheet.